This tutorial will demonstrate how to add a transportation selection option, whose data will originate from an on-premise .csv, to our pre existing Purchase Order Document. To achieve this connection, a new Connector will be created and properly configured. The purpose of this example is to simulate a real world scenario, where the option for the user to select the means of transportation of the order he is about to submit will be added as an upgrade to the current application. This tutorial is an advanced implementation of the data sources tutorial. In order to understand how data sources work, please read this section of the documentation. For this CRUD Operations tutorial, we are going to show how to interact with an external data source, by reading and manipulating its data. As our custom data source, we are going to use a CSV file with a list of companies that provide Transportation services. Please download this TransportationServices.csv (right click and save the document), we’ll be using it as a data source in this tutorial. 1. Start by accessing the management area, by clicking the option “Go to Tenants management”. 3. Select the connector, and a modal with connector data should be shown. 6. Now use these configurations to configure a connector on your local machine (or a Windows VM), following the installation guide and configuration guide. 7. Start the configured connector. 1. Access OMNIA homepage, select the tenant where you are going to model and you will be redirected to the modeling area. 2. Through the left side menu, create a new Data Source by accessing the option Data Sources then, Add new (blue button, top right side). Set its Name as “CSVSource”, Behaviour Runtime and Data Access Runtime as “External”. 3. Create a new Agent with name Transportation, and set it as using the external data source CSVSource, created on the previous. 4. Navigate to tab “Data Behaviours“, and define a behaviour to be executed on “ReadList”. This behaviour will be used for Query and List requests for this entity. Remember to change the variable filePath and csvSplitChar with your csv file full path and the character configured as the CSV column delimiter. 5. Create a new Data Behaviour for the operation “Read”, so that data is retrieved when you wish to select a Transportation Service for your order. 6. On “Data Behaviours” of Agent Transportation, define a behaviour, to be executed on “Update” (when a Transportation Service is updated on OMNIA). 7. On “Data Behaviours” of Agent Transportation, define a behaviour, to be executed on “Create” (when a Transportation Service is updated on OMNIA). 8. On “Data Behaviours” of Agent Transportation, define a behaviour, to be executed on “Delete” (when a Transportation Service is deleted on OMNIA). 10. Go to the Application area. 11. 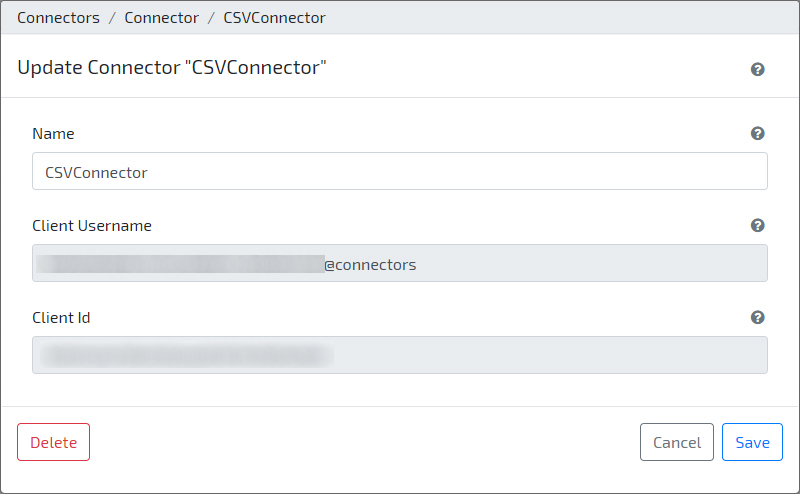 Create a new instance of the CSVSource data source, with code “LOCAL” and with the Code of the Connector (CSVConnector) that you have created. 13. On left side menu, navigate to Configurations / Transportation, identify the CSVSource data source instance (LOCAL) and check that the list is filled with data retrieved from CSVSource. 14. Now you can list and update your transportation services directly on your on-premise system, providing your connector is correctly configured and running. That’s it! Your Purchase Document now reads directly from a specific Data Source, and simulates the integration of a delivery system selection option alongside your order. Go to Advanced Connector Tutorial.